Sealaska Heritage Institute (SHI) is sponsoring a major program to revitalize spruce-root weaving, as part of its vision to establish the Northwest Coast arts capital in Southeast Alaska, with Juneau as the engine perpetuating both visual and performing arts. SHI has selected seven apprentice weavers from across Southeast Alaska to work with master Haida weaver Delores Churchill, said SHI President Rosita Worl. “We are pairing one of the best spruce-root weavers with weaving students to revitalize this endangered art form. This cadre of artists will in turn teach future spruce-root weavers across Southeast Alaska,” Worl said. The mentor-apprenticeship is scheduled to run May through November, 2017, and will include instruction by Janice Criswell and Mary Lou King on harvesting and preparing spruce roots for weaving as well as instruction by Churchill in the weaving process itself. The program ties in with SHI’s efforts to support sustainable art forms, where renewable materials can be harvested from the land. It also responds to recommendations SHI received from its first Native Artists Gathering, which brought together nearly 30 artists in 2015. The artists advised SHI on ways to strengthen Northwest Coast (NWC) arts in the region and helped identify endangered NWC art forms; spruce root weaving was ranked a top priority. The artists advised SHI to seek out NWC artists who are already skilled in related art forms and who, with further experience and training, could pass on the knowledge to future generations. SHI selected seven apprentices to take part in the program. They were chosen from a pool of applicants based on certain criteria, including skill level and potential reach of their instruction once their apprenticeship is complete. The selected apprentices are: Hans Chester, Yolanda Fulmer, and Lily Hope from Juneau; Marry Knutsen from Yakutat; Kathy Marvin from Hoonah; Mary Bernhardt from Sitka; and Deborah McLavey from Ketchikan. This is not the first time SHI has focused on the endangered art of spruce root weaving. In 2004, SHI launched a 3-year program to revive the art form in Hoonah, with Churchill as the instructor. More than a decade later, spruce root weavers in Hoonah are still meeting regularly to weave together. Churchill, of Ketchikan, learned to weave from her mother, highly regarded weaver Selina Peratrovich, and later from Chilkat weaver Jennie Thlunaut and Ravenstail weaver Cheryl Samuel. As a teacher, Churchill has been instrumental in revitalizing the ancient practice of spruce root weaving throughout the region, and she is a nationally recognized expert in gathering and preparing traditional weaving materials. Churchill currently serves on Sealaska Heritage Institute’s Native Artist Committee, which guides SHI’s art programs. The weaving mentor-apprenticeship is part of a larger program to revitalize endangered art forms. In 2016, SHI sponsored a mentor-apprenticeship on how to make traditional dugout canoes. SHI also plans to sponsor a mentor-apprenticeship on how to make mountain goat horn spoon carvings. 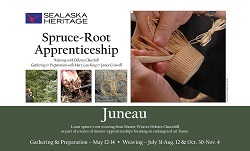 The spruce root mentor-apprenticeship is provided by Sealaska Heritage Institute and supported, in part, by Juneau Arts & Humanities Council, the City and Borough of Juneau, the Alaska State Council on the Arts, the National Endowment for the Arts and a private foundation.